Where can I get some of those gloves? 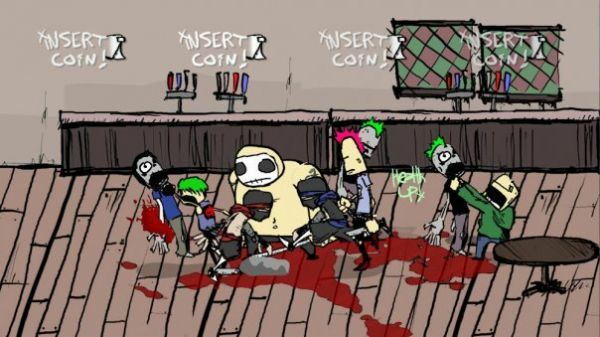 New details have emerged about Charlie Murder, the upcoming music-themed RPG/beat-em-up from Ska Studios. The game has been in development for quite some time, but new details leak out on a regular basis, so we're still pretty psyched about it. Charlie Murder will rely heavily on gaining levels, boosting stats with ability points, and finding/using various pieces of equipment, which includes things like badass Viking helmets, t-shirts, gloves and relics. The four core stats you'll be working with are strength, defense, speed, and anar-chi. These can be increased by spending point allotments earned every time you gain a level. You can also boost them temporarily by wearing certain pieces of equipment. Relics are perhaps the more interesting items in the game, as they can do cool things like increase your chance of finding rare loot or adding flames to your bullets. They can also bestow negative side effects, though, so watch what you wear. Stun: Randomly stuns an enemy. Crit: Increases the chance of performing a critical hit. Fire Resist: Flames don't hurt quite so much. Block to Cooldown: Blocking attacks refills anar-chi faster. Shockwave Falldown: Send out an elemental shockwave when you're knocked down. Shockwave Counter: Send out an elemental shockwave when you counter an attack. Fire: Light weakened opponents on fire. Rapid Jabs: Jabs deal less damage but are unleashed faster. Stasis: Air combo kicks can lock enemies in mid-air. Co-op in Charlie Murder will support four players either locally or online. There's still no set release date, but we can be patient! Page created in 0.2476 seconds.